Me — Hi, Gin. What a beautiful and usual name. Gin — (sigh) You found it in the http://www.20000-names.com/ site. It’s a Japanese name. It means silvery. Me — Ah yes. I remember now. It’s a really useful site. It should be called ‘Names of the World for writers to use’. Me - And you’re a stuntwoman. That’s a very glamorous occupation. Gin — You seemed to think so. I remember you had a hard time researching it. Me — Yes. So I decided to gloss it over. I think I threw you out of a helicopter a few times and maybe down a cliff, and that was enough of that. Gin – And you made up some stunt facts and figures too, like hitting the water at exactly 45 degrees or the spine breaks like a matchstick. Not very comforting when you’re the one being tossed out of a helicopter by an amateur writer. Me – I suppose so. But it still sounds good as a fact. I like to call it, prefabricated realism. I’m sure its in a skydivers handbook somewhere by now. So, how’s things with Solley? Gin – We’re good. The kids are growing up and we’re all settling into our new home. Me – I bet it’s beautiful. You sister designed it didn’t she? Gin – Yes. She’s doing one at the other end of the beach for Dan. Not sure how that’s going. Dan’s got the glad eye for her, but Mia is more that able for a puffball adder like Dan. Me – Ooh, so romance is in the air? Gin – Something’s in the air – probably Dan’s hair. Mia takes no prisoners. Me – Ah. See, I’m interested in that sort of news cos I’m a romantic writer, don’t ya know. Gin – Hm. I heard. Me – So. Back to you. 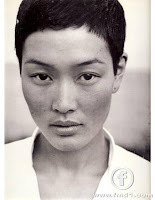 I am looking at your photo and I must say you bear an uncanny resemblance to Jenny Shimizu. Gin – That’s cos you have a crush on her, you big rice queen. Me- Moving on, what do you see in the future for the cast of Falling Star? Gin – Isn’t that up to you?? Me – Oh. Yes. I see what you mean. Okay, folks, that’s all we have time for. I’d like to thank Gin Ito for dropping out of my imagination to talk to us. Next time on POI I hope to have Mickey Rapowski from Green Eyed Monster as my special guest.